Wire rope and wire rope slings are integral parts of any oil or gas site. However, as common as this equipment is, the proper safety precautions and operations aren’t as apparent. It’s important to remind yourself and your team how to properly handle wire rope. To determine the working load of a wire rope, the nominal strength must be reduced by a design factor. The design factor will vary depending upon the type of machine, installation and the work performed. You must determine the applicable factor for use. Design factors have been established by OSHA, by ANSI, by ASME and similar government and industrial organizations. Never overload a wire rope. This means never using the rope where the load applied to it is greater than the working load. This is determined by dividing the nominal strength of the rope by the appropriate design factor. In turn, never “shock load” a wire rope. A sudden application of force or load can cause both visible external and internal damage. The sudden release of the load can also damage the wire rope. 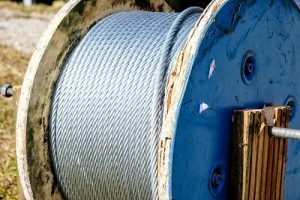 Regular periodic inspections of the wire rope, and keeping permanent records signed by a qualified person, are required by OSHA for almost every wire rope installation. The purpose of inspections is to determine whether or not a wire rope or wire rope sling may continue to be safely used in that application. If in doubt, replace the rope. When a wire rope has been removed from service because it is no longer suitable for use, it must not be reused for another application. Keep your worksite running smoothly by ensuring your wire rope and cables function properly and are inspected regularly. To learn more, download our informational cable flyer.